Contact us for information on the most extensive line of BMW performance products available, all backed by the only guarantee that matches the new car warranty coverage up to 4 years or 50,000 miles. Dinan Performance Engine Software extracts additional horsepower and torque as well as speeding up throttle response. The software removes the top speed governor, enabling your BMW to reach it’s natural top speed. Additional stages of Dinan software are available, calibrated for use with specific combinations of other engine products in order to ensure optimum performance, reliability and drive ability. Software upgrades can be performed on most new BMWs in little as a half an hour while you wait. Performance gains vary by BMW model. Typical power increases are from 8+ to 15+ for natural aspirated BMWs with basic or stage 1 software and 50+ to 75+ for 6 cylinder turbo charged BMWs and 75+ to 100+ for most V8 turbo charged BMWs. Dinan’s performance High Air Flow intakes and Cold Air Systems optimize feeding cool, oxygen rich air to your engine. Systems may feature an enhanced or complete replacement air box, cover and performance filter that increases the total volume of air. Some systems include larger mass air meter housings. Matching Stage 2 Engine Software is highly recommended for optimum performance and drivability. Typical power increases are from 5+ to 15+ for natural aspirated BMWs with stage 2 software and 12+ to 15+ for 6 cylinder turbo charged BMWs with stage 2 software. 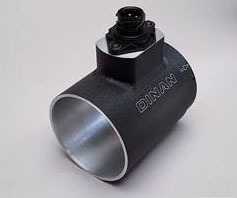 Dinan’s High Flow Air Mass Meter housing features a larger internal diameter, further improving the delivery of air to the engine for maximum output. The Air Mass Meter is not available for all BMW models. For use in conjunction with a High Flow or Cold Air Intake System and matching Stage 4 Engine Software. Not available for all model BMWs. Typical power increases are from 5+ to 6+ for natural aspirated BMWs. Reduced weight, 100% 304-stainless steel construction, a great exhaust note and superior flow make for the best performaning mufflers on the market. Larger polished or black (Newer Model BMWs) give the cars a tasteful high performance look unlike any other. Careful attention to detail ensures a perfect fit using factory mounting points. Typical power increases are from 5+ to 15+ for natural aspirated and turbo charged BMWs. 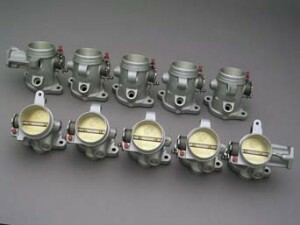 Dinan carefully bores the stock throttle bodies, increasing internal diameter for greater air-flow. The larger bore further improves air-flow for increased power output and more immediate throttle response. Matching Stage 3 Engine Software is recommended for optimum performance and drivability. Typical power increases are from 5+ to 13+ for natural aspirated BMWs Not available for all BMW models. Dinan’s strong yet incredibly lightweight carbon fber front strut tower brace efectively enhances chassis rigidity for improved handling and sharper steering response. Forged aluminum ends ensure maximum strength and bolt directly to the stock locations for a clean and simple installation. 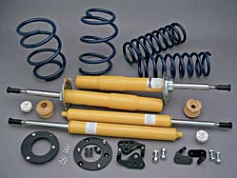 May be installed with any Dinan suspension system or the stock components. The matching carbon fber shock tower brace provides increased chassis rigidity at the rear of the cars, further improving the 5 Series’ handling capabilities. Made from the same tubular carbon fber as the front brace with forged aluminum ends for maximum strength. Dinan lightweight forged wheels accommodate the largest tire possible for your BMW, dramatically increasing overall grip as well as reducing under steer for razor sharp turn-in. Their strong, lightweight construction improves handling, brakes, acceleration and even ride quality..
Dinan suspension systems offer the grip that enthusiasts demand while maintaining a comfortable, well-dampened ride. Comprised of fully matched proprietary springs, Koni adjustable shocks & struts, Dinan’s unique camber plates and anti-roll bars, the system provides a comprehensive, pre-tuned suspension solutions that take the guesswork out of superior handling from your BMW without compromising ride quality. Available for most BMW models, with or without Electronic Dampening Control and Dynamic Drive. Mono Ball lower control arm bearings address the excessive defection associated with the stock bushings that negatively afect steering response as well as exacerbating the efects of brake shimmy, which can be particularly noticeable when larger brakes are installed. Ride quality is also improved as the mono ball bearings are actually more compliant. Featuring racing quality, spherical bearings in precision machined aluminum housings, the bearings are substantially larger than competing products for greater load handling capabilities and durability. A special Teflon lining ensures quiet operation. The Dinan mono ball kit provides the benefits of greatly reduced defection without the annoying clanking that is common among lesser quality products. The Dinan/Brembo front and rear brakes offer the ultimate in stopping power for the most demanding driving enthusiast. Extensive testing on the street and at the track has enabled us to develop custom systems that have been tuned for optimum performance while avoiding the foibles of typical ”big brake kits”, such as unbalanced proportioning, poor pedal feel and unacceptable noise levels, just to name a few. The brake calipers are available in either red or black, giving you the choice of a stealth or competition look. In most cases, the large rotors and calipers will require the use of aftermarket wheels for adequate brake clearance. Dinan’s lightweight performance wheels are recommended, providing proper clearance and the ability to fit the largest tires possible for optimum performance. Be sure to check with the manufacturer or distributor of the wheels you are considering in order to verify that they offer the necessary clearance, citing the Brembo “Gran Turismo” brakes as a reference. Lightened dual-mass flywheel improves driveline efficiency for faster acceleration and more immediate throttle response. The flywheel has been relieved of 7 lbs. for an 18% reduction in weight and a 40% reduction in rotational inertia. SMG equipped cars receive the added benefit of a reduction in shifting time, providing smoother gear changes in both the manual and “automatic” modes. Lowers the stock 2.93 final drive ratio for a substantial 17.7% increase in torque delivered to the wheels. Provides faster acceleration in every gear with only a minor increase in engine speed at cruise. 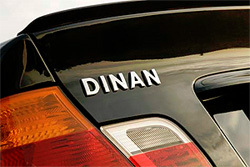 The Dinan badge cannot be purchased but rather is provided at no charge when your Dinan performance selections total 10 points, making your Dinan enhanced BMW as exclusive as it is exciting to drive.